Welcome! LPA District 4 and the Southwest Chapter are excited to invite you to the 2019 Spring Regional in Fort Myers, Florida! It's been a few years since our district has been to the area and with the Southwest Chapter recently becoming active again, we are looking forward to hosting this event in their chapter! The Drury Inn & Suites is in a great location just minutes from shopping, dining and entertainment at the Gulf Coast Town Center. 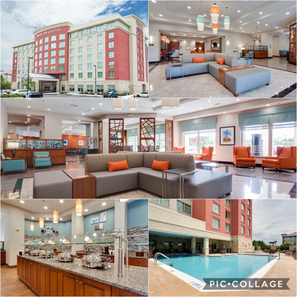 This newly built hotel is offering our LPA group a fantastic room rate of $99/night which includes several complimentary food and beverage options as well! The hotel is close to the Southwest Florida International Airport and attractions such as the beaches of Fort Myers and Sanibel. We have some fun things planned and a few special guests attending that's sure to make it a great time for everyone! Regional Highlights: Welcome Meet & Greet, District Meeting, Doctors Panel Workshop, Doctor Consults, Boccia Ball, Bingo and more! - LPA room block cut off date is April 12! *Main hotel room block is sold out! See the info for the overflow hotel. - Register early and save! LPA Early Registration Deadline is April 23! It’s going to be a great weekend and one you won’t want to miss! If you have any questions or need assistance please reach out here. We look forward to seeing you in May! Guest rooms feature either a king or two queen-size beds with a refrigerator, microwave, hairdryer and coffee maker. Reservations: Call 800-325-0720 and use LPA group #2361321 or book online at www.druryhotels.com/bookandstay/newreservation/?groupno=2361321. LPA room block reservation cut off date is April 12! Please be aware that the hotel is sold out outside of our room block. If any rooms become available after April 12 there is no guarantee the hotel will honor the LPA room rate. ​*UPDATE* Our LPA room block is currently sold out! If more rooms become available we will try to add them to our group block. You can also call the hotel periodically to check for availability. However, we have a contract with a second hotel nearby where you can reserve a room there! See info below. You must cancel before 12:00 PM hotel time on day of arrival to avoid a charge. Cancelling your reservation after this deadline or failing to show will result in a non-refundable charge for 1 night per room to your credit card. - Outdoor pool and hot tub. - Come mingle with LPA friends and meet new ones. Join us during the hotel Kickback from 5:30 - 7:00 in the lobby area and then stop by upstairs from 7:00 - 8:30 where refreshments will also be served. - Join us for a fun evening of music, Bingo and socializing with everyone! Bingo books will be available for purchase at the event for those that want to play. 1. Register Online & Pay via PayPal - Click on the button below to fill out the online registration form. Then click the PayPal Donate button below and pay online using PayPal. Enter your total registration and event fees amount. REFUNDS: A full refund of registration/event fees will be granted before April 25. All requests for refunds must be made in writing to lpadistrict4@gmail.com. Requests received after April 25 will be on a case by case basis. There will be no onsite refunds and registrants who do not cancel prior to April 25 and do not attend the regional are still responsible for the full registration and event fees.